Parsnip Javelin F1 is just amazing. I will never grow another variety again. It produces delicious and reliable roots with some tolerance to canker. Sow directly outside in a well prepared seed bed in shallow drills (1.5cm deep). The best sowing date is in late April/late May. Any earlier sowings are very unreliable and the plants are more prone to canker. Thin to 15cm between plants. Related to: Carrot, celery, celeriac, parsley, coriander, dill, chervil. Botanical classification: From the Latin pastus, ‘food’. Sativa means ‘cultivated’. I am delighted that parsnip is still a very popular vegetable in Ireland. 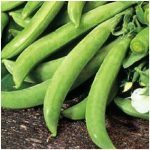 It is a very hardy and reliable vegetable to grow. I love the distinct sweet flavour. It requires a long growing season. In fact, the flavour is greatly enhanced by cold temperatures. 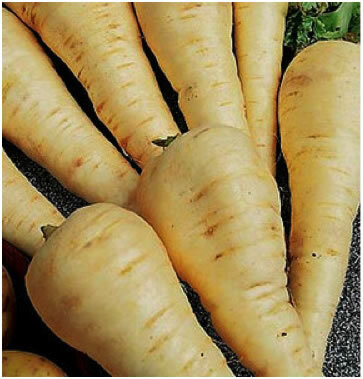 Parsnip is an ancient vegetable which originated around the eastern Mediterranean. The Greeks and Romans called both the carrot and parsnip ‘pastinaca’. During the Middle Ages parsnips were valued for their medicinal properties; for treating problems such as toothache, swollen testicles and stomach ache. During the 16th century, parsnip cultivation was widespread and became a staple for poor people in Europe. Parsnips were used as a sweetener until sugar beet was developed in the 19th century and apparently, a parsnip beer was made in Ireland. Parsnips prefer an open, sunny site. Deep sandy soils are ideal but even in heavy soils (especially if dug over deeply) excellent results can be achieved. Parsnips prefer well decomposed compost. The ideal pH is 6.5-7. It is important to remember that parsnip seed only lasts for one year. The traditional sowing date for parsnips is in early spring. It says on the back of seed packet to sow between February and March. I can guarantee that you will have absolutely no success if you stick to that. The best time to sow parsnips is in May. It is very simple: the warmer the soil, the quicker and better they germinate. I have even found April to be a difficult month for sowing parsnips in Ireland. If you sow in May the seeds will germinate far quicker and more evenly but the parsnips will also suffer much less from the most common parsnip disease ‘canker’. Parsnips require a very fine seedbed and even under ideal conditions they germinate slowly (about 2 weeks). The stale seedbed technique should be used if possible: this involves preparing the seedbed early in the year and then leaving it for weeds to germinate. The weeds should be hoed or raked before planting the parsnips. This is even more effective if repeated twice prior to planting thus eliminating many weeds before the crop is sown. I always sow seeds directly into the ground. They should be sown very thinly (about 5cm apart) in rows 30cm apart and about 2cm deep. Parsnip seeds are quite big so they can easily be spaced out accurately. They are, however, very papery and light, so choose a calm day for sowing. As soon as they have all germinated you can start thinning them out. 10cm spacing produces small roots, 15cm spacing produces medium sized roots, 20cm spacing produces large roots. If you forget to thin them the parsnips will be no bigger than a pencil. You may wonder why not sow them at their final spacing so we do not have to thin them at all? The reason is that not all seeds will germinate and you may want to allow for the occasional slug casualty. Parsnips should be rotated with the other members of the Umbellifer family. There is very little maintenance apart from thinning and weeding the crop. The parsnips are ready from October onwards. They are best left in the ground and harvested fresh as required. Parsnips get a better flavour if they are exposed to frost. This changes the stored starch into sugar and makes them sweeter. If, however, your soil becomes waterlogged it is better to dig them all out and store them in boxes of sand in a cool, frost free shed. They will keep until the following April. Canker is a very common problem with parsnips. I think you will always get a little bit. The symptoms are orange brown spots starting at the shoulder of the root. The canker organism also causes silvery-brown leaf spots. 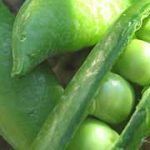 – Delay sowing until May. – Earth up parsnips in summer to prevent spores reaching the roots. – Increase soil pH to 6.5 to 7. If you eat 3 reasonable sized parsnips per week, storing from October until the end of March (24 weeks) you will need 72 parsnips. If you space the seeds 15cm in the row and you fit 3 rows in a bed (bed width: 1.2m) you will get 20 parsnips per metre. In 3.5 metres you will get enough parsnips from October to March.